In the past, several times I have been at the receiving end of anger resulting from a work of art that I've created (most notably in this case), and sometimes not anger but pruddish questioning ("why are you showing nekkid pictures?")... but never hate. 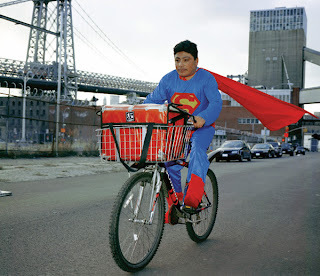 Until now, and not for one of my pieces, but for Mexican photographer Dulce Pinzon's iconic works from her "Superheroes" series. Background: Last week the second in the Washington Project for the Arts "Hothouse" exhibition opened at the Capital Skyline Hotel in Washington, DC. I curated this exhibition, which includes work by Jeannette Herrera, Andrew Wodzianski, Simon Monk, Dulce Pinzon and me. 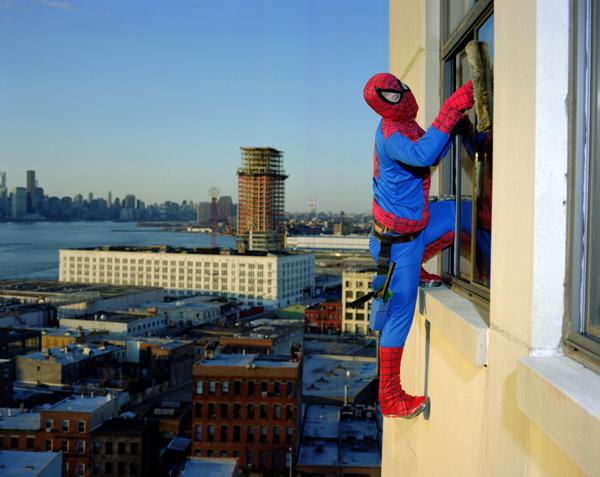 The exhibition offers five artists' contemporary interpretation of Superheroes. Dulce Pinzon elegantly and intelligently addresses the theme with a very famous and widely exhibited series of works in which she depicts immigrant workers doing their routine labor dressed as Superheroes. 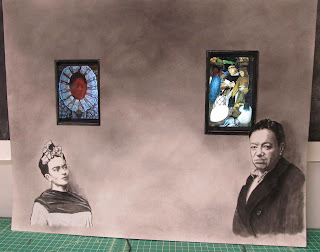 The connection is solidified by the titling of the works, which identify the person, where she originally comes from, and how much money they send back to their former homeland to support their families there. For example, the image to the left is titled BERNABE MENDEZ from the State of Guerrero works as a professional window cleaner in New York. He sends 500 dollars a month. It is a powerful and well-documented series of works, and one which I have exhibited in many fairs and curated shows around the nation. 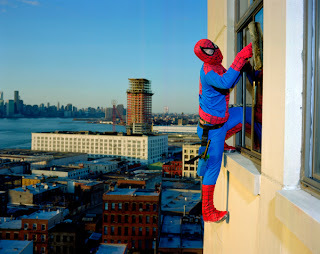 Pinzon's works always elicit a reaction from the viewers; often it starts (especially in younger people) as a "funny" reaction as they view Superman on a bike or Spiderman cleaning windows. they understand the human angle of the work. Regardless of how you feel about the immense illegal immigration problem that we have as a nation (and which I feel we will continue to have regardless of any legislation, as long as beautiful and rich countries such as our Southern neighbors continue to be run by corrupt and inept politicians and brutalized by powerful drug gangs, and as long as people view the USA as a place of hope and growth), the one thing that should not be a part of this issue is hate. Some of the lyrics to this song will make their way to the wall on the back plane of this ongoing video drawing... the works' embedded plasma screens rotate through images of Kahlo and Rivera paintings.